Fiercely passionate and unapologetically polemical, Phil Freeman’s debut book New York is Now! The New Wave of Free Jazz is by turns infuriating, maddening…and completely enthralling. 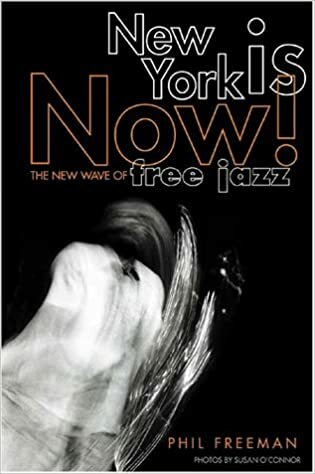 Early on, Freeman states that he wrote the book to introduce free jazz to music lovers “who may be only passingly familiar with it”, and it certainly can function that way. I am a practitioner of improvised music and not at all in that demographic, but I personally found the book very entertaining, educational, and in a certain way, inspiring. Written in 2001 and focusing primarily on the 90s New York (NY) free jazz scene, the book is laid out intuitively, surveying the careers of key NY-based improvisers like Matthew Shipp, the late David S. Ware, William Parker, Joe Morris, and others. It also touches briefly on the origins and some of the pioneers of the form (Cecil Taylor, Ornette Coleman) and includes information on related performance venues (Tonic, Knitting Factory) and record labels (Aum Fidelity, Eremite). In the later chapters, Freeman often takes specific entities to task for neglecting to support what he considers “real” free jazz musicians. There’s also a fine-enough but subjectively narrow recommended listening list at the end. Obviously, there are no mentions of the many important free jazz-ish musicians who have emerged in NY since 2001, but we can not fault Mr. Freeman for not possessing the gift of prophecy. While reading I laughed out loud more than once, usually more with appreciation than offense, at the outright audacity of Freeman’s freely deployed blanket declarations and highly opinionated asides. At times, he seems to want to position himself as the one-man authenticity gatekeeper of free jazz, and possibly all other forms of music as well. Sometimes he’s right (Rakim IS a brilliant rapper), sometimes he’s wrong (John Zorn is not a “dilettante”), and sometimes one would have to be a true NY jazz insider to truly understand the grudges and gripes Freeman is telegraphing. Mostly, though, he’s a fierce and sincere advocate for the musicians and music he obviously loves. Despite (or maybe because of?) this sort of vitriol, I mentioned above that I ultimately found this book inspiring. I wasn’t kidding. Freeman’s passion for the form is deep and infectious. As Matthew Shipp himself says in a back cover quote, “One can vehemently disagree with Mr. Freeman’s points and still be very stimulated by this book.” I disagreed with many of Freeman’s opinions, but was inspired by the stories he was able to capture and his wholehearted respect for the music,. The only thing that irritated me about this book was the occasionally redundant expository information from chapter to chapter, as if the author assumed or feared an acute outbreak of short-term memory loss amongst his potential readership. From time to time this repeated material makes the book feel like a patchy collection of essays thrown together instead of a book intended to cohere. That’s the small stuff, though. Overall, this book is a highly recommended must-read, no matter your level of knowledge of free jazz or the NY 90s scene. It’s in the stacks here at C4NM. Members come check it out, or pick it up on Amazon.